Interested in the possibility of a free four night stay at a fun little cocktail convention in New Orleans this July? We were too. Well all that stands between you and four free nights at Tales of the Cocktail is a simple drink recipe. 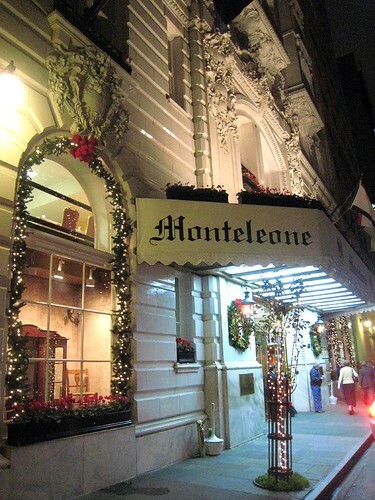 The Hotel Monteleone is celebrating the 60th anniversary of its famous Carousel Bar on May 21, 2009. From 1949 until about the late 60’s or 70’s the specialty drink menu boasted a “Monteleone Cocktail”. Unfortunately, neither the exact exact recipes nor specifics on the ingredients survived. Participating bloggers should post entries online, and all participants should e-mail their drink recipes, along with their name, address and phone number, to athornton@hotelmonteleone.com. The deadline is coming up, so get your jiggers ready. May the best drink win!